Paul R. Gray received the BS, MS, and PhD degrees from the University of Arizona. He joined the University of California, Berkeley in 1971 with the Department of Electrical Engineering and Computer Sciences.Gray's research interests include bipolar and MOS circuit design, electro thermal interactions in integrated circuits, device modeling, telecommunications circuits, and analog-digital interfaces on analog integrated circuits. He is a member of numerous engineering and computer science organizations and is highly regarded in the field. Gray also holds several prizes, including the IEEE R.W.G. Baker Prize, IEEE Morris K Liebman award, IEEE Solid-State Circuits award, and many more. Coverage of Bipolar 741 Op Amp: The coverage of the bipolar 741 op amp has been replaced with a low-voltage bipolar op amp, the NE5234, with rail-to-rail common-mode input range and almost rail-to-rail output swing. Use of SPICE: Extensive use of SPICE is included in this new edition. SPICE is used as an integral part of many problems and computer analysis is used as it is most commonly employed in the engineering design process -- both as a more accurate check on hand calculations, and also as a tool to examine complex circuit behavior beyond the scope of hand analysis. Coverage of cutting edge topics—more advanced CMOS device electronics to include short-channel effects, weak inversion and impact ionization. 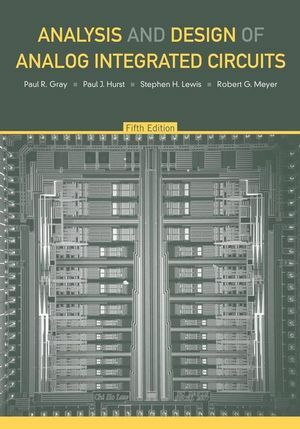 State-of-the-art IC processes that show students how modern integrated circuits are fabricated, including recent issues like heterojunction bipolar transistors, copper interconnect and low permittivity dielectric materials. Comprehensive and unified treatment of bipolar and CMOS circuits that helps students design real-world amplifiers in silicon. A number of open-ended design problems, included in the problem sets, exposes the reader to real-world situations where a range of circuit solutions may be found to satisfy a given performance specification. Extensive use of the SPICE computer analysis computer programs and is an integral part of many examples in the problem sets.